Fiverr is the freelance marketplace in which you can offer a number of services starting at $5. While I haven’t used it to make money, I have purchased services from the site before and I haven’t been disappointed. You can offer to do a number of things from creating memes, to helping people draft their fantasy football team. Do you know there’s a reason why bloggers keeps suggesting the same apps over and over. It’s not just because they are fans of them. It’s because of referral links. Every time someone takes their suggestion and signs up through a link they’ve provided, they get paid. For example, Ibotta pays $5 for every referral. There’s no reason why you can’t do the same without a blog. The next time you suggest shopping on Zulily, using ThredUp or any other store make sure you use a referral link. Stick it in your email or text signatures and see what happens. I don’t personally have experience doing this but it’s something I’ve always thought about. I’ve heard there is certainly money to be made from buying domains and flipping it for a profit. I just did a search for jerseygurl.com and noticed the owner is selling it for $3,000. Chances are the current owner bought it for no more than $15. Another domain was being sold for $69. We all know t shirts with catchy phrases are all the rage. Why not make some money from it? I’ve made my fair share of t-shirts on Teespring. Without any design knowledge or marketing, I’ve made about $75 from a single campaign. Granted its not much money. However, should you actually put a few hours a week into, I think it certainly holds some earning potential. I sell products on the promotional site, Zazzle. I don’t treat it like a part time job, so I can’t exactly call it one but I do get some money from it here and there. All it takes is turning a few great vacation photos into some promotional items such as a keychains and post cards. I cannot sing enough praise about being a fitness instructor. It offers a flexible schedule and doesn’t require a crazy financial investment to get started. For example, I teach one hour Zumba classes a few nights a week. Depending on your experience and location you can make up to $45 per one hour class. Most classes seem to start around $20 to $30 per class. And getting licensed to teach costs about $250 and takes a one day 8-hour training session. Not only is it a great part time job, but it’s a great way to stay in shape. Definitely a win-win situation. If you like to talking to new people, raving about products or attending new events, being a part time brand ambassador may be for you. Being a brand ambassador involves being the face of a particular company or product for a specific amount of time – usually 2 to 6 hours for a day. As people come by you usually provide a few facts about the product, pass out samples and take a few photos. I’ve been doing it for a few years and have made several extra thousand dollars per year – sometimes even an extra $1,000 per month. The company I do brand ambassador work with is based in NJ. However, there are several national companies to sign up with such as All Aces Promotions or Push Models. I don’t mean you should literally open a gym as a business. I mean be the gym opener and work the front desk in the morning. For years my, husband and I would work the opening shift at the gym from 4:30 am to 8:30 am right before the day job. Not only did we make some extra cash but we got a free gym membership as well. If you have a degree and speak English Fluently, you could be a candidate for VipKid. Vipkid is a platform in which you teach English to children in China. I haven’t done it myself, but I’m in the process of signing up and have read promising reviews such as this one. According to reviews, Vipkid pays $7-$9 per 25 minute class. I’ll be sure to update once I finalize the hiring process. I know being a delivery driver isn’t new, but I really think people underestimate the benefit. Sure it’s not a high paying job, but it’s got flexible hours. One man was able to pay off $45,000 in debt thanks to his pizza delivery job. If the pizza place doesn’t tickle your fancy, check out delivery gigs for Ubereats or Amazon. Don’t underestimate the amount of people who need rides to and from the airport or even a limo for a fancy date night. As long as you aren’t diabetic(many limo companies don’t hire diabetics) and have a clean driving record, being a chauffeur could be right up your alley. Another one I haven’t tried, but would if I was good with animals. Rover.com allows you to make money from walking dogs. According to this page, you can make $1,000 a month if you treat it like a part time job and walk 40 dogs a month – or walk 1 to 2 dogs every night for the month. It’s not exactly feasible for me, but it might be a good idea for someone who goes for an hour jog everyday after work. How many times have you read these lists from bloggers in which they suggest freelance writing but no concrete advice on who to write for? Well, here I’m giving you an example. You can write lists for Listverse and get paid $100 for each one they accept for publication. Think Buzzfeed type articles with real potential to go viral. Arise and LionBridge are two companies that offer customer service jobs amongst others you can do from home. While I can’t personally attest to it, the company was recommended by several friends and received great reviews. They require a commitment of ten hours per week. If you can squeeze that it in, it might be worth a shot. 13. Become a virtual assistant. In the digital age, virtual assistants are hot right now. Professionals everywhere need assistance with tasks such as organizing their inbox, managing their social media accounts or booking appointments. Check taskrabbit, freelancer and upwork to find these gigs. I know you didn’t expect to see a store clerk on this list, but it’s honest work that people often forget about it. Many stores need help during off hours long after they’ve closed with stocking shelves, cleaning up and running inventory checks. It may not be glamorous, but the hours may be perfect for a stay at home mom looking to bring in some extra cash at night. And there you have it – my list of 14 legitimate jobs to bring in extra money. No, it’s not the most innovative or trendy list. But I hope it gives you a solid foundation of some places to start looking and hope that you can make extra money without starting a blog or selling with It Works if you don’t want to. Have you tried doing any of the jobs listed? What have you tried to bring in extra cash? TERRIfic Words – If it costs your peace of mind, its too expensive. Good ideas. However, the one about not being about to drive with Diabetes made me a little sad (and that’s not your faut). My son is 12 and has Type 1 Diabetes and as long as his sugars are stable, I’m hoping he will be able to drive and do anything he wants. I’m going to send your link to one of my writers who is looking for extra work. The Listverse one is perfect for her. HI Nancy. Granted I don’t know your son’s situation, but I see no reason why your son wouldn’t be able to drive. The comment about diabetes was in relation to a relative of mine who wanted to drive limos part time. Unfortunately, many limo companies find diabetics to be a liability due to possibility of fainting under low blood sugar, etc. Though my relative had a license, he found it difficult to find a limo company to hire him because of diabetes. However, he was able to find a company to hire him – diabetes and all – and has been driving with the company for years. That being said I wish you and your son well. Something tells me he’s gonna do just fine. These are great Ideas but why do I need someone to do at least 5 of these things for me. 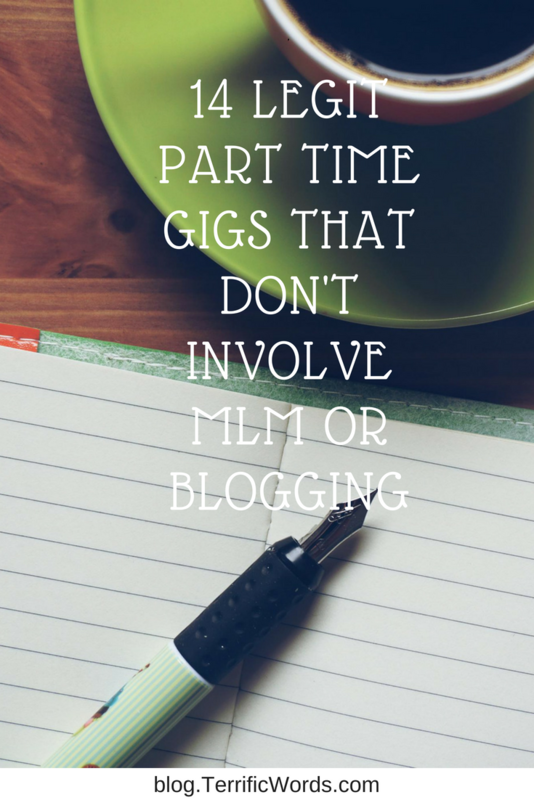 I dont any additional time after working my job and my blog is full time as well. Great list! I have not tried any of these but I noticed an increase of people I knpw becoming part time Zumba teachers. Cant knock the hustle! You have some really great options here that I never evens considered. I love the idea of flipping domains. I can definitely see a great profit in that for those that may have high demand. This is a great list. I love the open the gym idea. I would definitely do that if they had a shift that started once my kids are in school in the mornings. Great suggestions. I’m always looking for more ways to earn extra cash because you really can’t always count on blogging. Everyone has been raving about the teaching english abroad via an online method. I am in the process of trying to get approval for this one. It seems worth it to me. I like that you offered real suggestions. Things that people can do instead of telling them don’t do this and stop that. Your approach will reach more people in a positive way. Opening a gym is a great idea, I did not know that was a job. Great hours too. Thanks for sharing these suggestions on making extra money in a realistic way! I think being the gym opener sounds pretty cool!